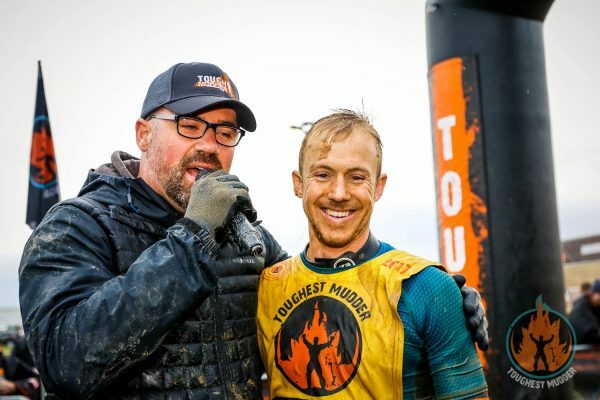 Toughest Mudder events are Tough Mudders new venture into the competitive side of obstacle racing. 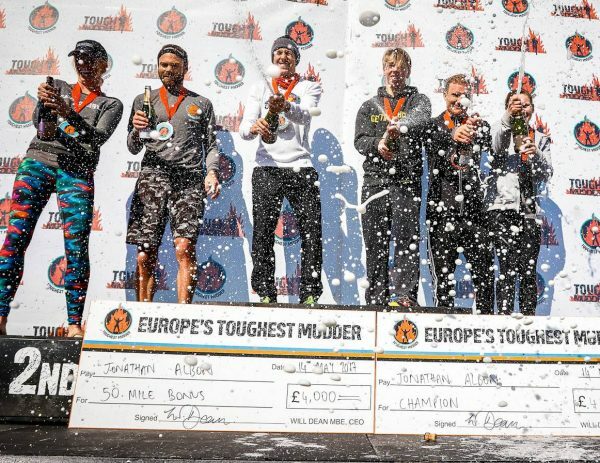 Up until this year their 24hour event ‘Worlds Toughest Mudder’ (WTM) has been the only competitive race in the Tough Mudder calendar, this 8 hour event in Europe would be a tribute to WTM along with 5 other 8 hour events held in America throughout the year. The race would be organised in much the same way as WTM but with some key differences. 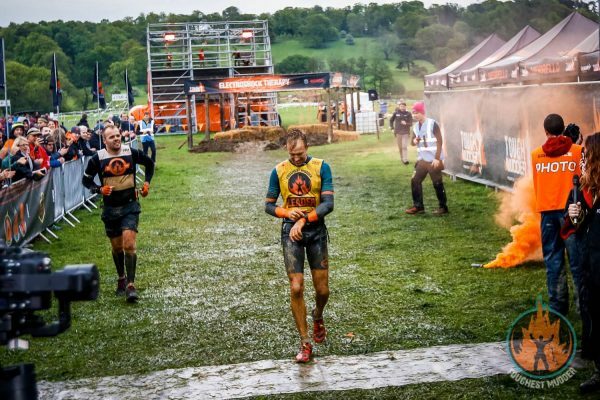 The event would still be as many laps of a 5 mile course as possible and would still have an ‘obstacle free’ hour to begin with and a grace period at the end to finish your last lap. The key difference was the time, 8 hours compared to 24 is practically a sprint and would change the dynamics of the race a lot. In essence you can actually run hard for 8 hours without as much thought to maintaining your health, over 24 hours it becomes more of a game of survival. Tough Mudder knew this and had made their bonus for a certain mileage to reflect it. £4000 would be awarded to whomever completed 50 miles (or did this first). That’s roughly two marathons in 8 hours with between 16-20 time and energy consuming obstacles per 5 mile lap. At times before the event I thought ‘that will be easy’ at other times I would calculate the required lap times and think ‘oh crap’. One thing was for certain though, the pacing would have to be perfect and there would be little time for changing kit or any other form of problem that can crop up. This meant my clothing choice especially would have to be perfect…not an easy thing to get right with the quantity of variables in a race like this. We would start at 12 at night and be running over churned up muddy ground for the following 8 hours, whilst being continuously dunked into water and muddy ditches. What would you wear? 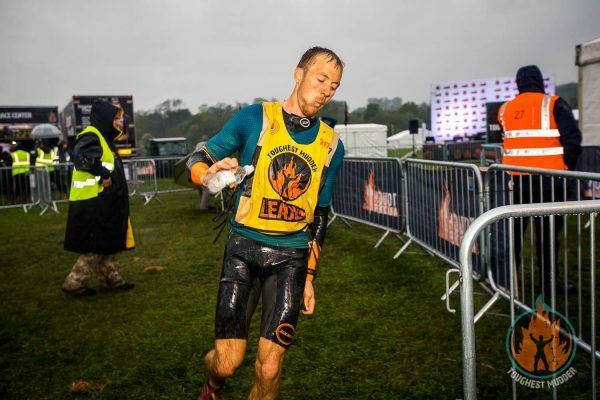 I decided on the Zone 3 Evolution swimrun wetsuit, this offered the best running flexibility you can get from a wetsuit and would hopefully keep me warm enough in the chilly conditions, it also had handy pockets for a clif energy gel that I would have per lap and a headlamp battery. On my feet would be the VJ Irocks which I was sure would give me a competitive edge. They have the best grip of any off-trail shoe around and are more than comfortable enough for 8 hours of hard running. When it came to my competition there was only one Brit I could imagine relishing this type of course and that was Connor Hancock, he was choosing not to race though. I knew to get the bonus it would help to be pushed and luckily enough one of the USA’s best was making their way across the pond for the event. 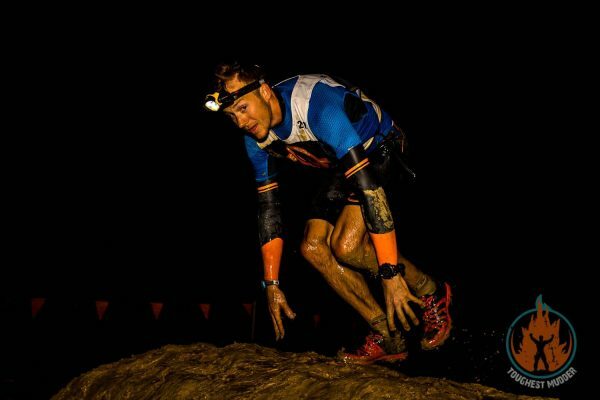 Chad Trammell has previously won Worlds Toughest Mudder and has already achieved the 50 mile target in a previous 8 hour Toughest Mudder event this year. Headlamps and strobes on we were finally away and my ‘Sunday long run’ could begin. My pacing strategy was simple, I would race happy, pushing hard enough but not so much that I couldn’t laugh, smile and joke around a bit. I was also keeping an eye on my heart rate and figured if I limited the amount of time I was in Zone 3 (over 160) I should be pretty comfortable for the 8 hours. It would just be my legs and muscles that would take a hammering, especially in some of the obstacles. A few of the obstacles were pretty physical and one I soon realised would be the most annoying. ‘Birth Canal’ was a cramped crawl where a sheet full of water is pressing you into the ground as you try to haul yourself along. To add insult to injury we had to go out and back in the obstacle which left you feeling hollow from the effort. There was only one obstacle that I manage to fail through the night and that was ‘king of the swingers’ where you had to jump out onto a trapeze, swing through and grab a rope which you then traversed along back to the ground. Rushing the transfer between trapeze and rope left me swimming and a resulted in a penalty run. This, the monkey bars/wheels and ‘Kong’ (rings) were the hardest obstacles but it was ‘Blockness Monster’ that caused the most stressful situations. At first I blamed a lack of experience from the European contingent of participants but later I heard the spinning blocks are much heavier in the UK than in the states. The obstacle takes a key balance between strength, technique and team work to get over two large spinning elongated blocks in water, a balance that didn’t seem to be right in the earlier hours of the event leaving some wasted minutes trying to get people over them. I was running strong throughout the first half and felt very comfortable with the idea of doing the 10 laps required. Needing the toilet on lap 5 was more of a nuisance than a worry and by lap 8 I finally spent more than 30 seconds in the pits to take care of business. I now had a healthy lead but was in the mood to get the job done and not delay the experience any more than I had to. This didn’t stop me from having a few conversations on the last lap and thanking all the marshals that were amazing throughout the night. By the time I crossed the line for the 10th time my legs felt completely trashed and probably hurt more than they have ever before. The mixture of smashing them into obstacles and continually speeding up and slowing down in between the obstacles certainly takes its toll. A great experience and a performance I am proud of but my attention now turns to the mountains and getting my legs ready for my first Skyrace in Zegama in two weeks time!